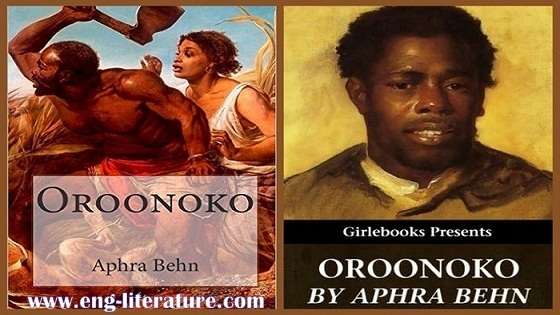 E-book Download Download Aphra Behn's Novel "Oroonoko" or "The Royal Slave"
Download Aphra Behn's Novel "Oroonoko" or "The Royal Slave"
In spite of its lack of popularity during Aphra Behn's lifetime, Oroonoko (1688) has ornamented the throne of English Novel of late. It has won the prestige of most widely read and most highly regarded work. Oroonoko: or the Royal Slave remains important. It also influenced the development of the English novel, developing the female narrative voice and treating anti-colonial and abolitionist themes. It developed the figure of the noble savage that was later to be made famous by the French philosopher Jean-Jacques Rousseau. Scholars have debated which work should count as the first novel in English. The honour often has gone to Daniel Defoe's Robinson Crusoe (1719); Defoe is often referred to as "the father of the novel." Some others regard Henry Fielding as the Father of English Novel. While other scholars insist that Oroonoko should have the honour in that it was written in a novelistic form and is not too short to be disqualified. In any case, Behn receives credit for influencing the development of the British novel at or near its origins. Oroonoko is the story of an African prince Oroonoko who deeply loves the beautiful Imoinda. Unfortunately, his grandfather, the king, wants Imoinda also. Imoinda is eventually sold as a slave and is taken to Suriname which is under British rule. Oroonoko's tribe is a supplier for the slave trade. One day an English ship arrives and the captain invites prince Oroonoko to come aboard for a meal and drinks. After dinner, the captain takes advantage of Oroonoko's trust and takes Oroonoko and his men prisoners. The ship then sets sail. When they arrive at their destination, Prince Oroonoko is sold to a British gentleman named Trefry who likes and admires the prince. As is the practice with all slaves, Oroonoko is renamed. His slave name is Caesar. Oroonoko soon finds out that Imoinda is a slave on the same plantation, but her slave name is now Clemene. A sweet love affair peeps in between them. Once Imoinda discovers that she is pregnant by Oroonoko. Oroonoko tries to free his family because he does not want his children born into slavery. His request is denied. He next leads a slave revolt but he is betrayed and is badly beaten when he is caught. Finally, he decides that he would rather see his family die quickly from his own hand than die the slow death of slavery so he kills Clemene and the unborn child. He is about to kill himself but decides to first have his revenge on those who would not give him his freedom. The final section of the story concerns Oroonoko's revolt and the horrible death of the hero, who is willing to die rather than bear the name of slave. This is one of British literature's earliest depictions of the "noble savage"--a person of innocence and true grace over against the contemporary city-dweller.